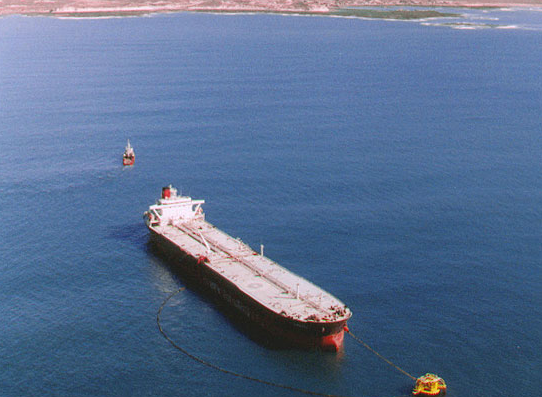 This cove, about 12n miles northward of Comodoro Rivadavia, is a terminal for loading crude oil. In the SW of Caleta Córdova, close in shore, there is a breakwater forming a small harbor. There are two short concrete landing stages, one for use at HW, and the other, covered at half tide, only available at LW. Small fishing vessels discharge their catch here, and anchor and shelter. 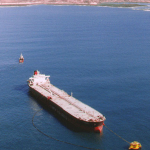 Launches also use there landing stages for taking crew to/from shore and for loading small quantities of provisions. There is also a small jetty in the harbour. Operators: TERMAP S.A. buoy (Terminales Maritimas Patagonicas) loading is from a SPM buoy (CALM type) located at lat 45º46´28´´S and lon 067º19´13´´W in about 36 m(120´) depth, delivering crude oil from deposits of 277000 cbm capacity, by a 32´´ 4100 m long pipeline to a 20´´ floating hoseline at average rates of about 3800 cbm hour; limited to vessels mínimum 39000 dwt and máximum 150000 dwt. Maximum bow draft allowed 18 m(59´). The buoy is 5m high, 12m diameter painted yellow, fitted with a fog siren and round yellow light. Yearly movement is about 7,5 million cbm. Caleta Córdova Prefectura Naval Radio (coastguard) LAP-W/T on VHF on ch 16.